What are some of the reasons for the decline in organ usage in many churches today? A. Limited access to the instrument; fewer and fewer organs available, since so many have been discarded. B. Lack of exposure to the instrument; not many children are being exposed to the instrument, plus the fact that it is often difficult to obtain permission to practice on a suitable organ. Smaller and more portable instruments are desired. C. Lack of teachers that are qualified and/or willing to teach the organ to students who have the prerequisite piano skills. D. Students who study music are influenced by popular culture, media, etc., in which the organ is totally foreign; it’s not “cool” to learn the organ. E. The amount of time and dedication it requires to master the organ. F. The pedals are intimidating! A. Initial purchase too expensive for many churches; expense cannot be justified in light of other financial pressures. B. Even if there is an organ in working order, it might be of poor quality. C. Neglected maintenance and expensive repairs. III. Negative effect of poorly-trained organists who choose inappropriate repertoire, play it badly, with poor choice of registration. IV. Influence of popular culture on churches. A. The shortage of organists, plus years of decline in the usage or organs in the life of the church, have led churches to turn to other instruments. 1. Organ vs. Guitar controversy: the guitar is seen as being more intimate and likely to draw people to a loving and approachable God, than the organ, whose “loftiness” and “grandeur” contradict this approach. 2. Belief among many that organs have been supplanted by other electronic digital instruments, i.e. the synthesizer, that “sound the same” as an organ; this is total fallacy, revealing a lack of understanding of the organ’s capabilities. 3. Belief that the organ is a “thing of the past” and not relevant for today’s worship styles. 4. 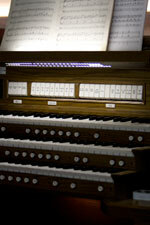 Belief that the organ does not blend with other instruments, tending to overpower them; this is due to poor choice of registration by organists. 5. Theological issue: tendency to emphasize the intimacy of God through relationship with Christ more than the grandeur and “other-ness” of God; simply a one-sided approach to the attributes of God. A. Insipid sounding registrations with “wobbly” tremolo (i.e. the typical old worn-out Hammond organ sound) or the opposite, which is deafeningly loud and shrill. B. This perception is caused largely by the general lack of familiarity of most people of what a good organ sounds like and how it can be used effectively in worship. VI. Focus of music ministries in churches solely on contemporary musical styles and concessions to contemporary culture; in efforts to reach unbelievers, churches shun that which they believe people might not be familiar with, i.e. the organ. What, if anything, can be done to reverse these trends? I. We should be willing to admit that not every congregation will embrace the organ, and there are some that simply will never have the means to have an organ. Our focus should be on restoring the organ to churches where it once was a part of their musical worship practices. II. Raise the general awareness and knowledge among church people about the organ; pipe organs, due to their size and complexity, are fascinating in many respects. III. Attempt to erase in the minds of people many of the popular misconceptions about the instrument. A. It can sound happy and joyful, not always mournful and sad; it can be an instrument capable of suggesting intimacy as well as grandeur. B. It can be used effectively in contemporary musical styles. It need not be an either/or option. IV. Emphasize the great effectiveness of MIDI technology in connection with traditional organ sounds, i.e. the “orchestral” capabilities of the instrument. V. Pipe organ “traditionalists” should celebrate rather than be threatened by the marvelous advances being made in digital sampling. Emphasize the authenticity and usefulness of “pipeless” digital organs. VI. Educate our congregations and worship leaders about the true nature of worship itself. God is interested in our hearts much more than the “art” which we offer to Him in worship. Many younger people today are expressing an interest in returning to their “roots,” which might be grounded in traditionalism. VII. Provide interesting, informative and entertaining venues that feature the organ, e.g. the “Pipe Organ Encounters” sponsored by the AGO. Well-stated. Thank you for concise summary of this trend that is prevalent. The organ. If churches wish to save the organ, then save the art of true worship. That is not to say that the organ automatically generates real adoration for God. But the lack of understanding in most congregations about biblical worship is the greatest single influence of its impending death. Thus, worship has been defined by contemporary cultural styles. But even those new styles are losing steam and what”s left? Still, a need for indoctrination of real worship. Here is my intuitive analysis of what”s needed and possibly coming in the next few years. A move to construct facilities with the ancient styles of 1000 years ago combined with the newest technological availabilities. Combine that will clarity of preaching, true biblical worship, and genuine fellowship, a church just might see a new fresh and living style yet unseen in western culture. And thus a new contemporary use for the organ, be it piped or electrically programmed. Precisely my goals as a lay musician. Integrate the pipe organ, by additions of synthesis, or wind, regardless of budgets. Preserve what we have. After all, we are worshipping God in three persons. Worthy to the highest degree of reverence and adoration. The foundation of a music ministry “old 100” should still be….our joyful noise. Make friends for the organ. Invite anyone who shows interest up to see the console, and if accessible, take them up into the pipe chamber. Kids are fascinated by this. Let them sit at the console and push buttons, pull out stops, play some sounds. Play Mary had a little lamb for the tiny ones. The opening notes of the Bach D minor Toccata and Fugue always bring a great response.. “Oh, The Phantom of the Opera!” They love it. Two weeks ago I gave a recital to celebrate 50 years of music ministry at the organ. I had a video camera trained on the console, hooked up to our church projector, and everyone could see what I was doing on the 12 foot big screen. Over 300 people attended the concert, and I have been getting comments, e-mails, cards, phone calls ever since. I always ask if this is the first time they are attending an organ recital. This time almost half the audience raised their hands. I took the opportunity to relate the location of the pipes to the three manuals and pedals. Many people said they were fascinated to be able to see what I was doing as I played. Our church has a fine three manual Casavant that is kept in first class condition all the time! The congregation are finding out what they have, just because they are being educated about the instrument, and finding out that it has amazing capabilities. Cheers! I began my music career as an organist. Then even the popular electronic organ fell into disfavor. I started playing piano which is not as competent an instrument as organ (“You can play an organ like piano but not a piano like an organ.”) Now I”m 60 years old and have gone back to organ, via electronics. However, people today are indoctrinated and this indoctrination continues to favor the piano. Now that is a fine instrument but even the best piano in the world still only sounds like a piano. I guess if you are willing to limit yourself that is fine. I choose not to do so and play organ. What we need is for one of our current leading contemporary worship artists to make a recording that creatively and effectively incorporates organ with a contemporary worship band (not orchestra for this recording). The recording should have intimate worship pieces where accoustic guitar and organ work together to create “intense intimacy,” adoration songs with full-on electric guitar, percussion and organ to express the awesome “otherness” of God, and celebration songs where the organ works with praise band to create an exciting, engaging accompaniment for corporate celebration. The organist will have to know how and when to creatively “pipe-down” and when to go “full-stop.” You”ll have to find a popular worship leader with an open mind to become your champion if you want the instrument to make a come-back. Then someone needs to make a “dueling instruments” recording with an electric guitarist going head-to-head with an organist on a BIG pipe organ in a fun competition and post it on YouTube. Both the guitarist and the organist should be masters of their instruments so that their virtuosity can be an offering of praise to God, and for “WOW” effect in order to get people to watch the video. The goal of all this? To open people”s eyes to the possibilities and the effectiveness of organ in worship and to make the organist “cool” again — it”s called marketing and it”s what HASN”T been done well and it”s a key reason why the organ is becoming obsolete. BTW – if you know of a church that wants to get rid of a pipe organ, we want one – contact me. Our church”s leaders “discarded” the original pipe organ in favor of an electronic organ in 1964. The electronic organ died about 15 years ago and hasn”t been replaced. You need to know that the organ is still very commonly used in the black church. Some churches have very well-trained organists but, in some cases, the organ is prominent, even if the musician does not play well. I, for one, love organ music and it makes me sad to think that it is being so down-graded today and unused. My brother is a great organist which he has mastered since his early teens and enhanced with training in college. He is our church organist. Unfortunately, one gets the feeling today that we are losing a sense of what is good and enriching in so many facets of life. The decline of the use of the organ in worship may well be an example of this phenomena. At our church we have a very good Yamaha keyboard, with a small range of good organ effects. I am the main pianist/keyboardist, and having had a classical training am very fond of the organ. I do use the organ effect occasionally – some hymns, the Lord”s Prayer, and at Christmas time with some carols. Because we are careful about when we use it, it does add an element of grandeur and majesty and definitely adds value to the worship aspect of the song/hymn it is accompanying. On our keyboard, I can use the piano and organ effects together, so that the organ effect is not overpowering, and it works extremely well. When it”s used, people often comment that it gave them goosebumps! The organ: whether in church or home is a dinosaur. Only a mere fringe of individuals have any interest in those homely old electronic organs that our parents or grandparents had in their living rooms. Those things have absolutely no value and are best suited in the junk pile. Organs in churches are regarded as archaic and out of place in modern times. The darn organs whether pipe or electronic are always way too loud and the dreary tone evokes a sense of impending doom. I don”t care to attend a church service and have the organ so loud that the stained glass window panes and objects on the altar rattle, and babies begin to cry from the racket. That”s nuts! More and more churches are shutting down the organs. Too big to move and too expensive to repair or replace something that has little desire to be heard. Mostly the much older folks have some sort of liking to the organ. They themselves probably still have one in their living room untouched since the 1970”s. What is heard now in churches are pianos and guitars. I prefer classical guitar amped with amped acoustic bass guitar or double bass. Sure the bass can be a tad annoying, but it”s never the problem that the bellowing pipe organs or even the electronic organs with giant tone cabinets that”ll fracture the church”s foundation with a sadistic organist at the controls. Organs have virtually no appeal to younger or middle aged people. And eventually there will be a near absence of organ enthusiasts out there. When I was growing up in the ”70s my parents had a Conn organ with speakers big enough to park a car in. My Dad was always bumping away on it, and I always thought it sounded pretty goofy. When my Dad passed away 10 years ago my Mom moved to an apartment and tried to sell the organ cheap. It never sold. Put a free sign on it in our driveway and no takers. 2 different piano shop owners came by to look at it and they didn”t even want it free! The organ still worked, too. Charity didn”t want it either. This was an organ that cost around 5K in the ”60”s. Desperate to unload the organ and speakers I had to pay a disposal fee to junk the darn thing. That”s how desirable those dreadful old organs are. My father owned a Wurlitzer Electrostatic organ that he purchased new in the ”50s. My father rarely played the organ. He liked to have “bragging rights” about some of the luxuries he”d splurge on from time to time. The organ was huge and had two gigantic speakers that were ornately carved. When we”d have company visit sometimes one of them would sit at the organ and play. The organ was loud enough to rattle the house, and my mother was always concerned a neighbor would complain. For decades that old organ sat in my parents” living room. My father still had an affinity for that organ. He passed away 20 years ago, and my mother was going into assisted living. We had an estate sale which was a success, except the organ was a no sell. It was priced at $500.00 and I remember getting one offer of half that but I foolishly declined. I desperately tried to sell the old Wurlitzer that worked fine and was hardly ever used. After weeks of no action on selling it, I offered it free to churches, schools, several music stores declined and even a homeless shelter. Nobody wanted it! I had to get my Mom”s house ready to spruce up to sell, so I had to have (any pay a disposal fee and removal fee of $200.00) for five men to remove the very heavy organ and its speakers from my Mom”s home. I really hated to just toss away Dad”s old organ, but when it comes to a practicality standpoint (I didn”t want the organ, my Mom of course couldn”t take it with her and my other siblings expressed no interest in it) what was there to do? I tried my best to offer the old Wurlitzer to anyone free, but no takers. Twenty years later I still think of Dad”s organ buried deep in landfill. Sorry Dad!! I for one prefer a good guitar mass. Growing up in the ”70s and ”80s I”ve been exposed to listening to acoustic guitar (classical nylon and steel strung guitars) in the parish my parents belonged to. There would be a bassist sometimes playing an electric bass guitar or an upright bass plugged into an amp with a giant speaker (20 inch woofer!) that rattled the tabernacle and electric guitars, drums, brass (trumpets and sax) and a fellow on the Moog synthesizer. This arrangement was VERY popular with younger churchgoers and even with some of the older ones. Those guitar masses I”d gone to so many times with my family inspired me to take up the guitar (classical) and the bass. The organ just seemed so undesirable to me and still does today. The parish my parents belonged to had an organ. An old pipe organ that sat in a loft with a wall of pipes behind it. The organ was rarely played, and when it was used on christmas mass, etc., it sounded so dreary and depressing compared to the spirited sound of the guitars and drums. That church today got rid of their pipe organ years ago. The former organ loft is now used to house media equipment. Spotlights, LCD projection unit and a host of other high tech gadgetry. If you want to keep the all the churches from closing up shop then it”s time to completely dump the antiquated organs. Times have changed and churches with organs as the main source of musical accompaniment are about as desirable as putting on a suit and tie just to go grocery shopping. Jm: Over 4 years later, is your church still looking for an organ? We need to pass our pipe organ on to others…. In our geographical area, many pipe organs in small rural churches left over from the Victorian era are totally uninspiring; sluggish pipe voicing, lack of upperwork, heavy action, notes sticking, syphers (air leaks) et al. Conversely, I am heavily into Hauptwerk (see http://www.pcorgan.com) and have built many such virtual pipe organ systems using Hauptwerk software (Milan Audio Inc.) for various people from high quality second-hand organ parts. However, the CofE is so conservative and snobby that such digital instruments are not generally accepted (i.e. too “revolutionary”, disturbing the established order of things). The lack of vision of the average CorE vicar appals me. No wonder the CofE has “… one generation to go before it faces oblivion …”, as recently commented to me by a retiring CofE vicar in our geographical area. The CofE is doomed, and more appealing spiritual systems and belief systems will simply takes its place. The complacency in the CofE simply beggars belief. There are those who say that the organ does not appeal to young people but, presented properly, my experience has been exactly the opposite. They’re the most enthusiastic listeners. On numerous occasions I have presented the organ to children, teens, and young adults and they responded very positively. After a 45-minute demonstration of the organ, one 12 year-old girl said, “My church does contemporary Christian music and it’s OK but I wish they did THIS kind of music!” I had not said one word about CCM. I had not prompted her in any way. To group after group of children and teens, I have ALWAYS had positive response. BUT, I played good music on a good organ. Bad music played badly by a bad organist on a bad organ is a real turn off, especially for those who are musically sensitive. As the late Dr. Delores Bruch (former organ professor at Iowa State University) once said, “Beauty is never out of style. People respond instinctively to integrity.” Tom Brokaw once said that he’d noticed that many young people equate popular with great when in fact popular is seldom great and great is seldom popular. The truly great things of this world over time do fall in and out of favor but they keeps coming back because they have enduring qualities. Playing a piano in a church as opposed to an organ is like shooting a squirt gun into the ocean. Just about as full an effect. Be careful. Snooty attitudes about the organ have contributed to the problem. Tremolo is very expressive, and a “worn out Hammond” is today a new sound to some while a favorite sound to many. When our pipe organ needed a six week renovation, I used my Hammond organ from home in church and demonstrated that it could be very effective in many styles of organ music. It is not the instrument but rather how it is played. Our pipe organ has tremulants are deep and fast, akin to a theater organ, and likewise are very useful for expressive playing. The attitude of the organist has as much to do with the acceptance and people’s enjoyment of the organ as anything else. If it is made to be an esoteric instrument, that’s what it will be. My parents used to go to a Catholic Church that had a pipe organ up in the balcony that on many occasions, would suddenly sound random notes without the organist’s intervention. The organ was as old as the church being built in the late 1920’s making it over 50 years old at the time. As a child I’d always giggle when that old organ suddenly started to squeal or go baaaaaaaah or tweeeeeeeeet in the middle of a sermon. It wasn’t long after the organ was no longer used. They began using guitar worship for all their masses. I liked it way better than the stoggy old organ music except I missed hearing the organ pipes screeching and groaning at odd times! When I was 14 I played classical guitar and later electric bass in the church band. I abandoned the Catholic Church long ago based on science and reason, but I still have good memories of playing guitar and bass in the church band, and the unforgettable, uncontrollable utterances of that decrepit old pipe organ. 1 Pings/Trackbacks for "The Decline of the Organ"